Priced: $86.99 - $110.00 Rated: - 4 stars out of 5 by 9 reviews. Don't be fooled by the mesh upper on the The North Face Men's Ultra 50 GTX XCR Trail Running Shoe—its Gore-Tex Extended Comfort Range membrane can handle keeping your feet dry when you encounter rainy weather and soggy trails. The Ultra 50's semi-curved last enhances stability and features a no-slip heel and medium-volume forefoot and instep. Put the miles in the rain or sun with the lightweight Ultra 50 GTX XCR® by The North Face®, trails won't be able hide behind the weather anymore. Motion-control platform provides support and stability for runners with low arches. provide support for the midfoot. Lace-up closure provides a comfortable and snug fit. Heel and tongue pull provide an easy on and off. GORE-TEX® Active Shell provides extreme breathability with durable waterproof and windproof protection. Designed with a thin membrane with a fine denier textile. GORE-TEX Paclite® provides lightweight protection. GORE-TEX Performance Shell is a two-layer construction that provides an impenetrable barrier against wind and water. TPU top cap for added protection and durability. 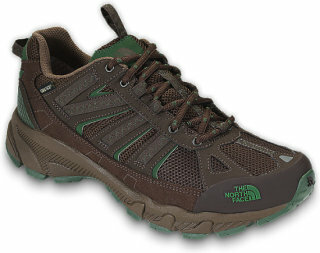 The North Face Ultra 50 GTX XCR is a rugged trail shoe outfitted with GORE-TEX® for a breathable, waterproof membrane. The synthetic upper features mesh panels for lightweight breathability and a protective TPU toe cap for durability. The lightly padded footbed and EVA midsole offer cushioning while the UltrATAC™ rubber outsole provide trail-ready traction. A new lightweight, dedicated performance trail shoe bolstered with a waterproof, breathable GORE-TEX® membrane for increased all-weather protection on the trail. With a motion-control platform, they provide support and stability for runners with low arches. Mesh on upper provides optimal breathability crucial when you're putting up the mileage. Compare specifications to related products. Everything from The North Face. I just went for a short walk with these on after getting them today and I have to say they are the most comfortable running shoes I have ever owned. The comfort on the heels and the arch support is amazing. I also absolutely love they way they look...excellent design. The North Face is awesome, GO GOAT! First time buying NF shoes, very comfortable, more comfortable than my shoes with the swoosh. Purpose of buying them was to hike up Camelback Mountain in AZ and also to do some hiking in Hawaii. During my hike at CB shoes performed wonderfully. Traction and comfort better than I thought. Will definitely buy NF shoes again. This is the 3rd pair in 5 years that I have bought for my husband. He loves them, they look great, fit great,and he can walk through wet grass and not have wet feet. they hold up well to hiking, workouts, walking, and general wear and tear. North Face never disappoint me. This sneakers are very comfy for all travel terrain, lightweight, and great support. I using this to travel Thailand, Phuket, Malaysia and Singapore. The grey/blue look awesome and stylish! I bought these to replace a pair of Columbia's that were nearly identical. These were far more comfortable on my feet especially when I walked longer distances. I highly recommend them. I purchased these shoes becuase I trust The North Face brand, and thought having Gortex would make them ideal when walking to my office from the outdoor parking lot. I was wrong. When walking in the rain, my toes get soaked where the water thrown forward when my foot makes the return step forward. I am very disappointed with the quality of this show for wet, I mean damp, weather. I would hate to see how they perform if I were to accidentally step in a puddle. The shoe does have a good side, it is very comfortable and has held up well on my three trips to China last year, including a day climbing the Great Wall - Badaling. The support is excellent and the laces are of good quality. If you are looking for a comfortable shoe and don't need it to be waterproof, this shoe is for you, otherwise, I suggest trying a different brand. I am a big fan of North Face products but not their shoes. Like other reviews written on Zappos I have found that the soul separates on this shoe model. I would not recommend this product...do not get this shoe! Bought these shoes in Sept of 2012 and the shoes look great and felt great but with in a month the soles of the shoes started comming apart. With in 2 months one of the shoes has started showing a hole in the side of the materal. Its now Jan of 2013 just 4 months after I bought them and was working in the rain the other day and stepped into a large water puddle and my feet got wet. I have to say thow...the shoes still look good to me and feel great but just disappointed to the build quality of the shoe.